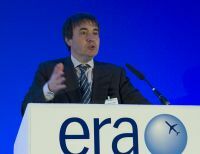 Simon McNamara made his public debut in Edinburgh last week as the new Director General of the European Regions Airline Association (ERA). 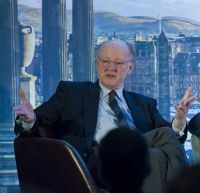 At its Regional Conference he delivered a polished and authoritative performance, facilitating topical panel discussions and encouraged lively interactive debate from delegates. In the audience, his mentor for the past 14 years, Mike Ambrose, representing the Flight Safety Foundation, must have been proud. At the city’s Grand Sheraton Hotel Mr McNamara had an important agenda to tackle – not least the contentious topic of EU Regulation 261/2004 on passenger rights and the implications of the impending revisions – some good, some that could be further improved, the new DG noted, with attendee Jean-Louis Colson, Head of Unit for Consumer Rights at the European Commission, in the spotlight. Caroline Green, Director of Customer Services at Ryanair noted the Ash cost Ryanair €28 million and it continues to make payments today. In some cases the airline was having to pay out for 5-star hotels and alcohol for stranded passengers, which it had never been consulted on. Green Cook blamed the easy ‘quick to claim’ culture in Europe, egged on by claim agencies with enticing no win, no fee offers. She cited a case where as a result of a captain becoming ill inflight the airline had to make a diversion at a cost of €21,000. The whole flight had netted just €9,000. Colson acknowledged challenges from the panel that there was a disparity on passenger rights across other EU transport modes, especially high-speed rail, but said this was being looked at to make them ‘more convergent’, along with the improved revisions. The new revision centres on a change of flight delay threshold for compensation from three hours (current) to five hours (9 or 12 hours for long haul extra EU journeys), the possibility to correct misspelled names without costs, partial return of a return ticket (for no shows), a new right to carry musical instruments (Reg 2027 /89) and full transparency on baggage allowances. Another theme of the ERA meeting was the loss of a number of smaller carriers these past 12 months – among them Germany’s OLT, Cirrus Aviation and Augsburg Airways which will wind up soon. Others have dramatically changed their business models to adapt to the challenging markets,. Blue1 in Finland could no longer compete with the plethora of low fare entrants coming into its marketplace said CEO Janne Hattula and is now carving out a role as an ACMI airline with its nine Boeing 717 (MD) jets. Switzerland’s Darwin Airline, which absorbed the remnants of neighbour Baboo and took out their Embraer ERJ 190s and Q400s to focus on the Saab 2000, describes itself as a ‘multi alliance’ model – working with Swiss, Czech Airlines, Lufthansa and Alitalia. Another responding to the challenging market conditions is SkyWork Airlines in Switzerland. It is continues to grow its niche network out of Berne with smaller Dornier 328 turboprops. The company completed a management buyout at year end and CEO Tomislav Lang now holds 40% of the company. It retains one of the three Q400s in the fleet and continues to have first call access to the other two (on lease) when demand calls for it. We are on the way to break even says COO Rolf Hartlieb. A new model is Air France Hop! and Jean-Yves Grosse, Chairman of Regional introduced its network – an amalgamation of regional carriers Alinair, Brit Air and Regional since the end of March – all AF subsidiaries. Aer Arann, which looked shaky a year ago is on a much firmer platform as a fully-fledged rebranded Aer Lingus Regional. It increased its traffic 32% last year and its new agreement with Aer Lingus runs to the end of 2022. Interim CEO Sean Brogan is confident the airline will double its passenger numbers to over two million within five years. Just like the General Assembly (which this year is in Salzburg 2-4 October) the Conference is a superb networking opportunity with commuter airline leaders attending including Ian Woodley of bmi Regional, Mauricio Merio Chairman of Switzerland’s Darwin, and Martin Isler who holds a similar position with Luxair. News broke during the Conference that ERA stalwart Jon Horne was back in charge of nationalised Cardiff Airport and that Lydd in Kent has had a go-ahead to develop a full A320/Boeing 737 runway subject to impending final approval. One key pledge of the ERA directorate under its new leadership is to improve the profile and perception of the regional airline industry. How better to make use of media was thus a key theme on the first day, providing food for thought at the new media landscape and the so called ‘fourth estate – the citizen journalist,’ heralding the explosion of social media. According to David McMullen, Vice President of SimpliFlying, only 213 airlines are on Twitter of which only 88 Tweet, but only 24 tweet with real strategy. He advised not to give responsibility of your brand to very junior employees. The average age of a user is 38, he said, it isn’t for kids. Steve Dunne, CEO of Brighter Group, said that people shouldn’t do social media if they do it badly. It would, he suggested, raise the question of other things (operationally in the company) that aren’t done well. 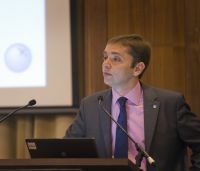 Tom Christides, now an independent media consultant after many years heading communications at Blue1, urged delegates to prepare their social media strategy in ‘peacetime’, not when there is crisis. McMullin pointed to the success of a low cost marketing campaign with Spicejet in India to proactively promote its turboprop operations. Within six months the campaign helped generate 88% load factors in a fortnight.